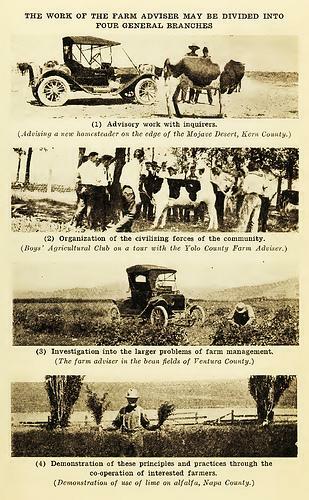 This year the University of California Cooperative Extension (UCCE) Humboldt celebrates its 100th anniversary. The Humboldt office is a part of the nation-wide Cooperative Extension system that formed through a partnership between land grant universities, counties and the US Department of Agriculture to provide science-based educational resources to everyday Americans. In California, Humboldt has the distinction of being the first county to establish a Cooperative Extension Department, with the appointment of the state’s first farm advisor in 1913. Humboldt also was the first county in the state to organize 4-H clubs, which have supported positive youth development and leadership for years and are still thriving within the Cooperative Extension family of programs. Although UCCE Humboldt has changed over the past 100 years, it has remained dedicated to improving the quality of its residents’ lives by providing information and outreach on crop production, livestock, forestry, health, nutrition, gardening, and food preservation. The 1914 legislation that created the nation-wide Cooperative Extension system was built on a foundation of several other key acts. The Morrill Act of 1862, signed by President Abraham Lincoln, created a national university system, known as the “land-grant” school system, to teach the practical subjects of agriculture and engineering. In California, the first land-grant college was the University of California (UC), which was founded in Berkeley in 1868. Another key piece of legislation that made Cooperative Extension possible was the Hatch Act of 1877, which created federally funded agricultural experimental stations used for the development and demonstration of practical farming methods to help meet the needs of a growing nation. Finally, in order for agricultural and home economics research and practices to reach rural populations, the Agricultural Extension Service (now Cooperative Extension) was formed with the passage of the Smith-Lever Act of 1914. In cooperation with the US Department of Agriculture, Cooperative Extension was to act as a bridge between the land-grant universities and farmers, providing information, advice, and problem-solving assistance to farmers. In the early 1900s, Humboldt County was extremely remote—no railroads led into the county, so it was generally reached by boat and some road access during summer months. 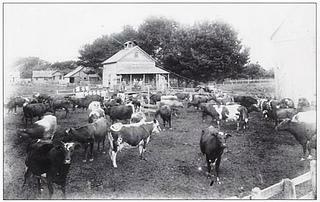 However, Humboldt had a growing dairy industry and a booming lumber industry. Its agricultural production was also flourishing. By 1914, Humboldt County was home to 1,534 farmers, who on average owned 300 acres of farmland and produced up to 12 tons of carrots per acre, with the potential to produce more if provided up-to-date, scientific information and advice on crop improvement. A Cooperative Extension farm advisor would be able to provide these services but, as required by UC, Humboldt County first had to allocate funding to help support extension work as well as organize a “farm bureau,” a group of farmers that would guide the farm advisor. 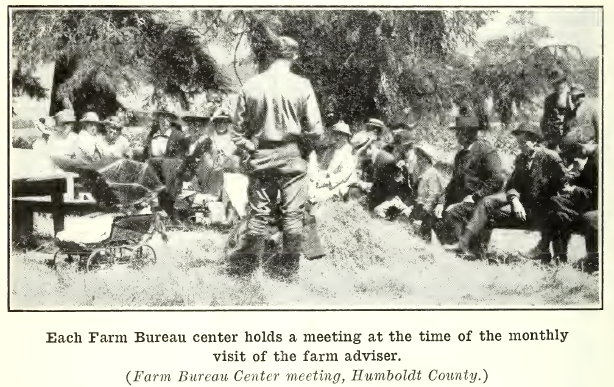 As a result, Humboldt was the first county in California to create a farm bureau, which is now part of the California Farm Bureau Federation. 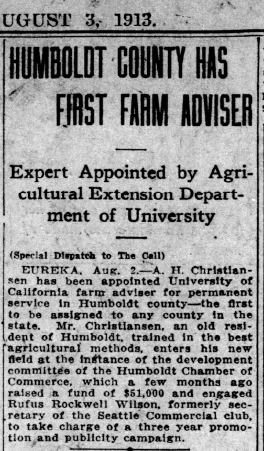 In July 1913, anticipating the passage of the Smith-Lever Act, Humboldt County, with the support of the newly formed farm bureau, appointed Andrew H. Christiansen as the first Cooperative Extension farm advisor in California. Humboldt residents were proud of their initiative, which reflected their eagerness to improve the county’s agricultural industries. With the new farm advisor, Arcata, Ferndale and Fortuna established the first 4-H clubs in California in October 1913, formalizing youth education and civic engagement as a cornerstone of the Cooperative Extension program. The role of the new farm advisor was to bring information from UC to farmers who desired assistance and advice, with the goal of increasing farm yields and solving community problems. In the words of B.H. Crocheron, the first Director of Cooperative Extension in California, the farm advisor’s “work is on the farms and among the people." Christiansen, who himself was a dairyman and had been raised on a dairy farm in Ferndale, immediately began addressing the needs of farmers by conducting soil and water tests, giving advice, and demonstrating cultivation techniques. Christiansen also proved to be a good friend by “establish[ing] a good-fellowship throughout the county." Because farm advisors were so engaged with the community, many people regarded them as friends and counselors, and even as kin. UCCE Humboldt continues to take pride in its “friend helping friend” work ethic, striving to make connections with communities, families, and youth to provide them with resources that will improve their lives. While much within UCCE Humboldt has changed since its inception, many of its programs continue to address similar themes in a changing world. For example, since the 1910s, UCCE Humboldt has emphasized economic development; finding efficiencies; uses and markets for byproducts of production; conservation of energy; integrated pest management in the home, garden and farm; new crop development; food preservation; and business planning and family succession. Since the 1980s, adapting practices to help minimize impacts on the environment has been a major focus of UCCE Humboldt’s programs. Furthermore, there have been changes in the communities that are served by UCCE Humboldt’s programs, with specific attention now given to minority and other underserved audiences, as well as urban and suburban audiences. Whether it was a 100 years ago or just last week, UCCE Humboldt advisors provide practical solutions to life’s problems, connect the community to the informational resources of the University of California, and provide trusted research-based solutions.